The Goonellabah Sports & Aquatic Centre is joining in 2018 Women’s Health Week with free activities every day from Monday, 3 September to Friday, 7 September. The Jean Hailes Women’s Health Week is a week dedicated to all women across Australia to make good health a priority. SWITCH Gym Manager Roberta O’Brien said the week was about celebrating health and wellbeing in a fun and inclusive environment. “We will have surprise events every day between 10.30am and 11.30am and every woman regardless of age, size or shape is encouraged to join us,” Roberta said. “Women’s Health Week tells us that the two biggest barriers for women not maintaining a healthy lifestyle is ‘lack of time’ and ‘health not being a priority’. Women’s Health Week is the time to put ourselves first, for just one week, and start making positive changes that can last a lifetime. Join the team at Goonellabah Sports & Aquatic Centre for surprise events and activities every day from 3-7 September between 10.30am and 11.30am. For more information phone the friendly GSAC team on 6625 5370. 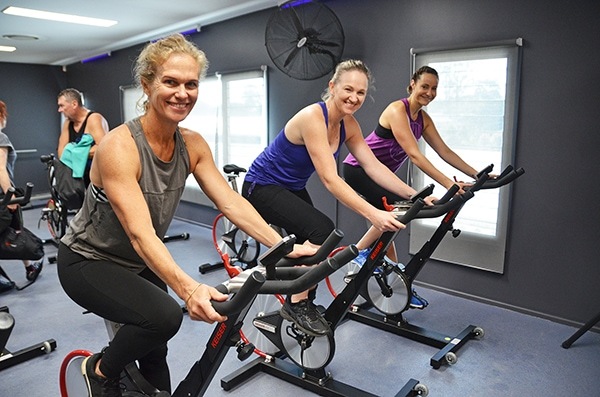 Image: SWITCH Gym staff Roberta O'Brien, Michelle Saunders and Alex Wadsworth are offering free activities to celebrate Women's Health Week.